Silicone is not inert. Silicone from breast implants “bleeds” through the surrounding envelope and is present in the surrounding capsule or migrates to other distant locations. Silicone and/or the multiple chemical contaminants elicit foreign body reactions associated with granulomatous inflammation and fibrosis. Silicone and its contaminants have the potential for significant toxicity in the implant recipient. Foreign Body Reaction to Biomaterials (2009). Link. Adjuvant breast disease: An evaluation of 100 symptomatic women with breast implants or silicone fluid injections (2009). Link. Women with silicone breast implants and unexplained systemic symptoms: a descriptive cohort study (2013). Link. A clear pattern of symptoms was reported including fatigue, joint and muscle pain, morning stiffness, night sweats, cognitive and dermatological complaints. Women with silicone breast implants and autoimmune diseases have shown differences in human leukocyte antigen (HLA) typing as compared with asymptomatic women with implants. Association between the silicone implants and their complaints should be taken seriously. A case series survey of silicone breast implant patients (1999). Link 1 and 2. To survey the symptoms of a large group of breast implant patients displaying illness and to determine if any clinical or serological features predominate. A referred sample of 415 patients with fatigue of long duration, followed by muscle/joint pain, cognition problems, polyneuropathy, and localized breast pain. The latency period between the initial implant surgery and the appearance of symptoms was 1 to 4 years. 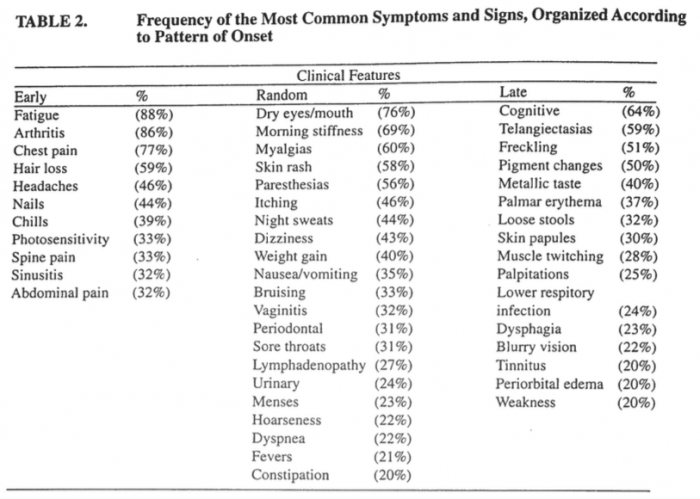 Fatigue…was the most frequently noted initial symptom by women. The most frequently heard symptom, new to this group since implant, included extreme fatigue of long duration, muscle aches, joint pain, memory/concentration problems, polyneuropathy, breast pain, and insomnia. … Other significant findings included urinary frequency, loss of libido, alopecia, sinusitis, dry skin, night sweats, and oral ulcers. …New symptoms appearing in this study include irritability, dental problems, tinnitus, and mood swings. The most common findings on physical examination were malar, discoid rashes, telangiectasis, and lived reticularis skin rashes seen in 346 patients (83.4%), breast hardening seen in 329 patients (79.3%), joint pain swelling in 380 patients (74.2%), photosensitivity in 302 patients (72.8%), changes in breast shape in 290 patients (69.9%), and lymphadenopathy in 287 patients (69.2%). … The stiffness associated with arthritis and myalgia was a consistently debilitating feature experienced by these women. …hair loss, poor healing, nail thinning, increased bruisability, dental problems…difficulty swallowing was common…Repeatedly the tongue was coated…thought to be a viscous mucous layer and not yeast since several cultures were negative for yeast. Abnormal laboratory findings, included cholesterol levels greater than 200, Schirmer’s less than 9, sedimentation rate below 6 or above 30, positive polypeptide BB, IgG subclass 3 above 80, positive ANA … consistent with the finds in silicone toxicity. 90 study participants delivered children after having breast implant surgery. … The children were ill with learning disorders and chronic infections of the ears or sinuses. Silicone adjuvant breast disease may be a novel disorder, possibly autoimmune, producing atypical syndromes that do not fit within the classic diagnostic criteria of known conditions. Furthermore, the diversity and distinction of silicone adjuvant breast disease may require the medical community to accept it as a new entity, encompassing a neurological and connective tissue disorder. Siliconosis: A spectrum of illness (1994). Link. Siliconosis is characterized by a spectrum of illness that may affect a number of organs. In its most common form, siliconosis is a musculoskeletal pain syndrome characterized by overwhelming fatigue, arthralgias, and myalgias. This form of the illness is reminiscent of a chronic flulike state. Influenza patients have overwhelming fatigue, fever, myalgias, and arthalgias. Common laboratory tests, such as complete blood count, erythrocyte sedimentation rate, and ANA are normal in individuals with influenza. It is difficult to document the presence of the virus, although the disease is diagnosed by physicians in the absence of positive viral cultures. Release of immune mediators (cytokines) by mononuclear cells is the most likely mechanism for the presence of constitutional symptoms. A similar circumstance may occur with the release of cytokines by mononuclear cells ingesting silicone. The criteria for classification of fibromylagia include generalized pain in symmetrical areas of the body including those above and below the waist. Also included is pain with palpation in 11 of 18 tender point sites [most tender points are located above the waist]. Other factors associated with fibromylagia include nonrestorative sleep, daytime fatigue, chronic headache, and irritable bowel syndrome. Criteria for chronic fatigue syndrome include persistent fatigue sufficient to reduce daily activity by 50% or more for a period over 6 months, along with chills, cervical lymphadenopathy, headaches, myalgias, sleep disturbance, and fever. Patients with silicone breast implants have similar but not identical symptoms associated with these other disorders. In addition to the musculoskeletal symptoms associated with siliconosis, a minority of patients also experience skin rash, alopecia, fever, lymphadenopathy, and arthritis. A significant number of patients develop a Sjögren’s-like disorder characterized by xerophthalmia and xerostomia. However, there is an absence of autoantibodies and cellular infiltrates associated with classic Sjögren’s syndrome. Systemic lupuslike syndrome may appear with arthralgias, skin rash, and fever in the absence of detectable ANA. Rheumatoid arthritis-like disease may be characterized by years of polyarthritis without significant erosions or periarticular osteopenia. Neurological symptoms in the form of shortterm memory loss, paresthesias, and neuropathy have been reported. Patients whose implants were removed have reported improvement in symptoms. The improvement is not immediate in most patients. Some patients report improvement that has its onset 12 months or more after explantation. This time course of improvement does not follow a course expected with placebo effect. One would predict that improvement with explantation would be immediate with placebo effect. Explantation of the implants, along with the surrounding capsule, removes a large amount of silicone from the patient. Improvement over 12 months or longer suggests that an abnormal immune response is decreasing with removal of the silicone. Our current understanding of silicone breast implants is that silicone is not inert and has the capability of causing systemic tissue damage. Chronology of systemic disease development in 300 symptomatic recipients of silicone gel-filled breast implants (1996). Link. Breast Implant Toxicity (2016). Link. Destiny rides again: the reappearance of silicone gel-filled breast implant toxicity (2017). Link. Silicone breast implant–associated musculoskeletal manifestations (1995). Link. Three hundred consecutive women with silicone breast implants (SBI), referred to the arthritis clinic with a variety of musculoskeletal complaints, were evaluated for the presence of underlying connective tissue disease. A significant proportion of SBI patients referred for rheumatic evaluation have clinical manifestations highly suggestive of an underlying connective tissue disease. Furthermore, improvement of their symptomatology follows explanation of the implants in over half of the patients. Human adjuvant disease following augmentation mammoplasty (1988). Link. Two patients are described in whom a progressive systemic sclerosis-like illness developed several years after silicone augmentation mammoplasty. Both had removal of breast implants, followed by marked-to-complete recovery from clinical abnormalities. This entity is increasingly recognized and has become known as human adjuvant disease. Severe manifestations of autoimmune syndrome induced by adjuvants (Shoenfeld’s syndrome) (2016). Link. Autoimmune/inflammatory syndrome induced by adjuvants (ASIA) encompassing conditions linked to previous exposure to an adjuvant substance. The majority of severe ASIA cases were related to HPV vaccine, silicone, influenza vaccine and mineral oil injections. Is explantation of silicone breast implants useful in patients with complaints? (2016). Link. Firstly, the inflammatory response could be reduced after explantation. Secondly, explantation of the implants may remove a nociceptive stimulus, which may be the causative factor for many complaints. We calculated from the literature that explantation of the silicone breast improved silicone-related complaints in 75 % of the patients (469 of 622). Immunology of Silicone (1999). Link. 5. these immunological abnormalities and symptoms are reversible upon removal of the breast implants (in 50-70% of cases). The criteria to establish medical causation are defined, and based on those criteria it is concluded that silicone breast implants cause immunological disease. Immune functional impairment in patients with clinical abnormalities and silicone breast implants (1992). Link. Immunopathologic effects of silicone breast implants (1995). Link. Suppressed natural killer cell activity in patients with silicone breast implants: reversal upon explantation (1994). Link. Repeated exposure to silicone gel can induce delayed hypersensitivity (1994). Link. Silicone-induced modulation of natural killer cell activity (1996). Link. Immunologic stimulation of T lymphocytes by silica after use of silicone mammary implants (1995). Link. The data presented confirms that silicone implant patients respond immunologically to the silicon dioxide contained in mammary prostheses. Antibody to silicone and native macromolecules in women with silicone breast implants (1994). Link. Anti-collagen autoantibodies are found in women with silicone breast implants (1993). Link. Protein denaturation induced by cyclic silicone (1997). Link. It has been demonstrated that D4 can induce denaturation and conformational changes in fibronogen and fibronectin and it can be expected that protein molecules that have undergone denaturation or conformational change induced by D4 may act as antigens and stimulate the immune system to generate antibodies, ultimately resulting in autoimmune disease. Cellular immune reactivities in women with silicone breast implants: a preliminary investigation (1997). Link. The frequency and intensity of cellular immune responses against collagen I, collagen III, fibrinogen, and fibronectin were significantly increased in silicone breast implant recipients versus controls. Silicone gel-filled breast and testicular implant capsules: a histologic and immunophenotypic study (1999). Link. These findings suggest that silicone implants induce chronic inflammatory responses in many adjacent capsules, which consist of anamnestically responding T cells, reactive B-lymphocytes, and macrophages. Silicate antibodies in women with silicone breast implants: development of an assay for detection of humoral immunity (1996). Link. Silicone breast prosthesis and rheumatoid arthritis: a new systemic disease: siliconosis. A case report and a critical review of the literature (1998). Link. Silicone is not an inert substance and silicone compounds were found in the blood and liver of women with silicone breast implants. HLA-DR53 may be a marker of predisposed subjects. We report the case of an adult female patient with silicone breast implantation for bilateral mastectomy (performed 12 months before) and a unique syndrome characterized by low-grade fever, chronic fatigue, arthralgias of the hands, dysphagia, dry eye, increased level of rheumatoid factor and decreased value of complement C3 and C4. The internist should become familiar with the immunological disorders related to silicone breast implants, often so marked to require the explantation of the prostheses to improve symptomatology. However, perhaps due to the leak and spreading of silicone, the progression to a severe systemic involvement may remain despite the implant removal. Follicular lymphoma adjacent to foreign body granulomatous inflammation and fibrosis surrounding silicone breast prosthesis (1995). Link. Objective clinical assessment of posture patterns after implant breast augmentation (2015). Link. Silicone breast implant-induced lymphadenopathy: 18 Cases (2011). Link. Of note, silicone migration can occur due to gel bleed with intact envelope in the absence of implant rupture. Silicone usually migrates to the axillary lymph nodes but may migrate to other lymph nodes as well as extranodal sites. In our patients, not only were axillary lymph nodes involved but silicone migrated also to internal mammary, supraclavicular, and mediastinal lymph nodes. The lymphatic drainage of the breast occurs through three principal routes: the axillary, trans-pectoral, and internal mammary pathways. In case of obstruction of normal lymphatic flow, collateral pathways open. These include contralateral internal mammary and mediastinal lymphatics and could also explain the rare cases of pneumonitis. The involvement of the thyroid is exceptional but has been reported previously. Silicon granuloma mimicking lung cancer (2012). Link. Neck lymphadenitis due to silicone granuloma after mammary implants (2013). Link. Silicon granulomas and dermatomyositis-like changes associated with chronic eyelid edema after silicone breast implant (1998). Link. Developed severe chronic eyelid edema and inflammation. Extensive systemic evaluation and serologic studies were unrevealing, prompting biopsy of the eyelids. Scanning electron microscopy demonstrated particles of material within the granulomas, which were revealed by electron probe x-ray microanalysis to contain silicon. The presence of silicon-containing material within areas of eyelid inflammation supports a role for silicon in the pathogenesis of this patient’s condition. In the absence of other predisposing conditions, migration of silicone breast implant material must be considered. Hard, pink nodules on the upper extremities —Diagnosis (2011). Link. Demonstration of silicon in sites of connective-tissue disease in patients with silicone-gel breast implants (1993). Link. Silicone is known to leak from breast implants and spread to surrounding tissues, including lymph nodes. The presence of silicon-containing material within sites of connective-tissue disease supports a role for silicon in the origin or pathogenesis of such conditions in patients with silicone-gel breast implants. All patients with connective-tissue disease should be questioned about exposure to various forms of silicon. Defective arthritis due to silicone: a foreign body reaction (1983). Link. Systemic sclerosis after augmentation mammoplasty with silicone implants (1989). Link. Our demonstration that silicone escapes from elastomer-silicone-gel breast implants and appears to be closely associated with a chronic inflammatory reaction suggests that silicone plays a role in the development of certain cases of systemic sclerosis. Imaging of common breast implants and implant-related complications: A pictorial essay (2016). Link. Silicone Gel Breast Implants: The UK IRG Report. Letters to the JNEM (2003). Link. The double capsules in macro-textured breast implants (2015). Link. Restricted and shared patterns of TCR beta-chain gene expression in silicone breast implant capsules and remote sites of tissue inflammation (2000). Link. Silicone breast implants (SBI) induce formation of a periprosthetic, often inflammatory, fibrovascular neo-tissue called a capsule. Histopathology of explanted capsules varies from densely fibrotic, acellular specimens to those showing intense inflammation with activated macrophages, multinucleated giant cells, and lymphocytic infiltrates. These data suggest that shared, antigen-driven T cell responses may contribute to chronic inflammation in SBI capsules as well as systemic sites of tissue injury. Oestrogen receptor-alpha and -beta expression in breast implant capsules: experimental findings and clinical correlates (2014). Link. Primary Squamous Cell Carcinoma Arising from a Breast Implant Capsule (2016). Link. Microscopic polyangiitis following silicone exposure from breast implantation (2014). Link. Polyarteritis Nodosa Presenting as Digital Gangrene and Breast Lesion following Exposure to Silicone Breast Implants (2015). Link. Polyarteritis nodosa (PAN) is a rare systemic necrotizing vasculitis of small and medium sized arteries. We report a case of a 49-year old woman who presented with PAN following exposure to silicone breast implants. In vivo contaminant partitioning to silicone implants: Implications for use in biomonitoring and body burden (2015). Link. Endocrine activity of persistent organic pollutants accumulated in human silicone implants–Dosing in vitro assays by partitioning from silicone (2015). Link. Persistent organic pollutants (POPs) accumulated in human tissues may pose a risk for human health by interfering with the endocrine system. Silicone acted not only as source of the POPs but also as a sorption sink for lipophilic hormones, stimulating the cellular hormone production. Autoimmunity and the gut (2014). Link. Left unilateral breast autoinflation and intraprosthetic collection of sterile pus: an unusual operative finding of silicone gel bleed with silicone lymphadenitis (2008). Link. In this article autoinflation of the left breast with regional lymphadenopathy is presented. Upon exploration, the prosthesis was found to be filled with sterile pus, showing an inward movement of a thick creamy material in an otherwise macroscopically intact prosthesis. Radiological trap and oncological precautions in a patient who has undergone a permanent withdrawal of PIP breast implants (2015). Link. In conclusion, the removal of a breast implant without capsulectomy may result in the formation of a seroma whose images resemble those of an implant. Every serous effusion in a breast lodge having contained a silicone implant must evoke the diagnosis of anaplastic large cell lymphoma. Late seroma during pregnancy, a rare complication in prosthetic breast augmentation: case report (2012). Link. Seroma in Prosthetic Breast Reconstruction (2016). Link. Candida albicans Infection of Bilateral Polyurethane-coated Silicone Gel Breast Implants (1996). Link. We present a report of bilateral Candida albicans infection of polyurethane-coated silicone gel prostheses and an acute onset of unilateral capsular contracture 4 years after breast augmentation. Aging of retrieved gel breast implants: A comparison between two product generations (2015). Link. The goal of the present study is to compare the mechanical ageing of two breast implant generations and assess if the use of one generation rather than the other is advantageous in terms of durability. For that purpose, 21 explanted BI were analyzed in terms of biomechanical characteristics and compared. Twelve BI were textured anatomic specimens of 5th generation and 10 BI were round textured specimens of 4th generation. All the specimens were produced by the same manufacturer. Implantation time ranged from 3 to 130 months. Both the shell and the gel of every specimen were analyzed. Results show that the mechanical properties go down with the implantation time for all the implants. Moreover, the shell of round implants appear to be less resistant than the shell of anatomic specimens with 25% lower rupture forces. Determination of siloxanes, silicon, and platinum in tissues of women with silicone gel-filled implants (2003). Link. This investigation of human tissues by a combination of element-specific and species-specific analytical techniques clearly demonstrates for the first time that platinum and siloxanes leak from prostheses and accumulate in their surrounding tissues. Talc deposition in skin and tissues surrounding silicone gel-containing prosthetic devices (1994). Link. A high incidence of talc was found within the skin and tissues adjacent to silicone-containing breast prostheses. The high incidence of talc deposition in the skin and tissues surrounding silicone implants suggests that talc either is introduced at the time of implant surgery (possibly in association with the silicone elastomer bag, tissue sizers, or surgical gloves) or is released into the tissues as a silicone gel contaminant during gel bleed. Talc, a known sclerosing agent, may contribute to periprosthetic fibrosclerosis. Silicone in the liver: possible late effects (1989). Link. Migration and accumulation of silicone in the liver of women with silicone gel-filled breast implants(1995). Link. Pathology of silicone leakage from breast implants (1995). Link. Gel bleed and rupture of silicone breast implants investigated by light-, electron microscopy and energy dispersive x-ray analysis of internal organs and nervous tissue (2016). Link. Distant migration of multiple siliconomas in lower extremities following breast implant rupture: case report (2016). Link. Complications related to retained breast implant capsules (1995). Link. Residual silicone detection using mri following previous breast implant removal: Case reports (1995). Link. Although previous reports have suggested that remnants of the implant capsule are reabsorbed after explantation surgery, the persistence of the capsule in fact may be associated with implant fragments and silicone gel leakage. Breast Implant Illness: Symptoms, Patient Concerns, and the Power of Social Media (2017). Link. Chronic Pulmonary Silicone Embolism Related to Saline Breast Implants (2016). Link.